It is with enormous sadness that Te Papa acknowledges the passing of Cliff Whiting (6 May 1936–16 July 2017). 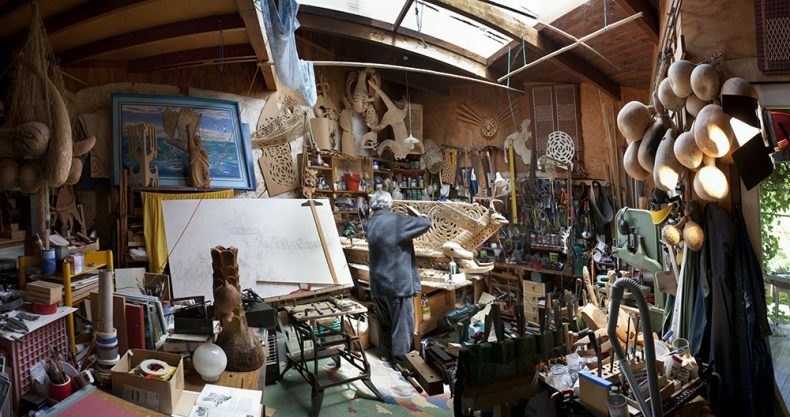 His contribution to Te Papa and the arts in Aotearoa was immeasurable. 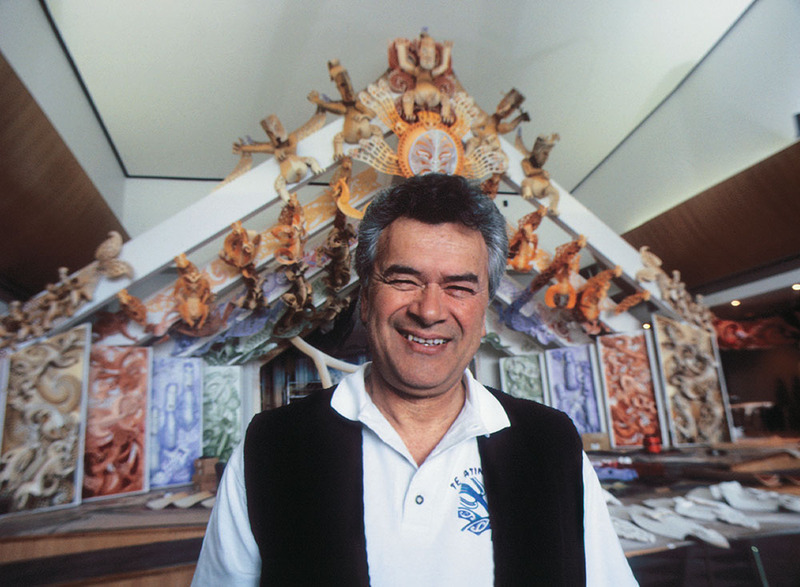 An esteemed teacher and practitioner of Māori arts, Cliff was appointed Director Director Bicultural Relations for the Museum of New Zealand in 1993, and was instrumental in shaping Te Papa. He went on to serve as Te Papa’s first Kaihautū (Māori co-leader) and oversaw the creation of his most widely recognised contribution to the museum: Te Hono ki Hawaiki, a magnificent wharenui, or meeting house. 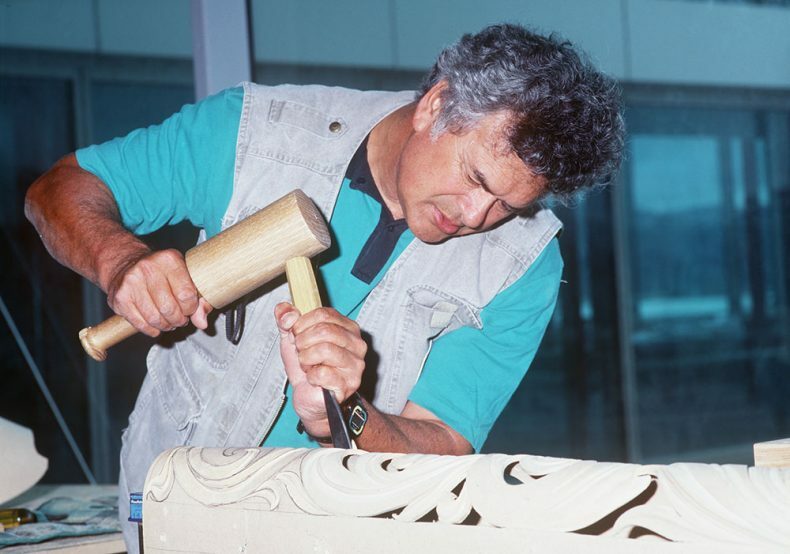 Cliff’s passion to revitalise and share Māori arts endured his entire life, and he had a profound impact on Te Papa and many of the staff who worked with him. This was especially evident among the Kaitiaki Māori/the Māori staff, some of who still work in the museum. They have shared some of their memories here. Haere atu rā e Pā, kia tae atu koe ki te wai ahupuke i o tipuna, kia wetea mai ko te tōpuni tauwhāinga. Hei kahu mōhou ki te whakarewanga tauā. Ko te toroa tai naku i kapu mai, i te huka o te tai, whakangaro ana ki ngā tai rutu, aue, taukiri e.
With a heavy heart, we farewell a great leader, an exemplary, visionary artist for his people. Cliff Whiting was a significant, early influence of mine. While I was at school, I read about his art practice and the wharenui restoration work that he was leading with the Historic Places Trust. An important difference that he made, which is core to our own practice as Māori working in museums, was ensuring that the haukainga, the home people, were central to decision making and actively involved in every aspect of the work. I was profoundly inspired by this, and the fact that there were job opportunities working with whānau, hapū, and iwi on kaupapa involving arts and taonga tuku iho. His approach shaped my own understanding and purpose of the role of a kaitiaki Māori, way back then. 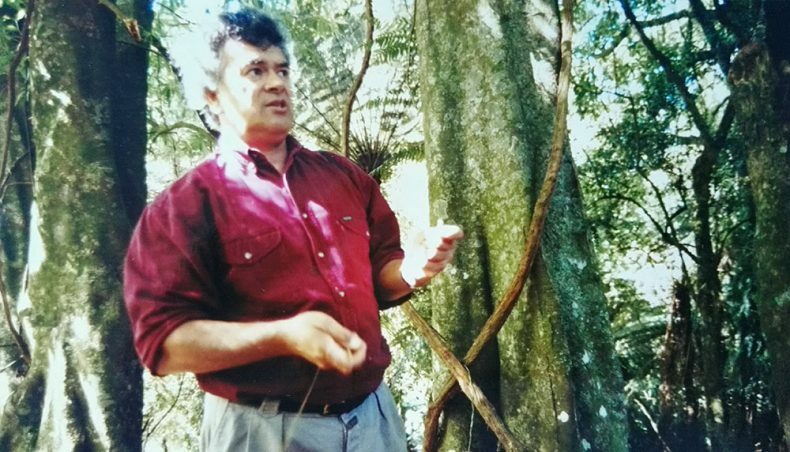 Years later, in 1993, Cliff became our boss at the National Museum, as the first Director of Māori and bicultural development. Cliff was hugely supportive of all the Māori staff at the museum and what we were tasked to do. At the time, major changes required leadership and vision. I remember his pōwhiri in front of Te Hau ki Turanga, with Hema Temara leading us all in a “papaka crab” haka. On his first day in the job, Cliff casually joined our little round table in the Ethnology room wearing a leather jacket. He wore suits too, particularly when he was appointed the Kaihautū in 1995. But I’ll always remember him being comfortable not so much in a boardroom, but out in the community, or in the ngahere, creating, visualising, and sharing his knowledge. When we were fully engaged in the development of the Museum of New Zealand Te Papa Tongarewa, Cliff was our main support. He encouraged me to take on big projects. When I said I didn’t want to be a Concept Developer for the new Māori exhibitions, he just uttered simply, “it’s your future”. Cliff took me to iwi and Māori art meetings for a couple of years. That’s when my eyes were first opened to iwi engagement and the potential through his approach, of listening and gathering in ideas, then laying out a vision. He would work in a way that was alongside people. He had his own style. People warmed to him and the respect was reciprocal. 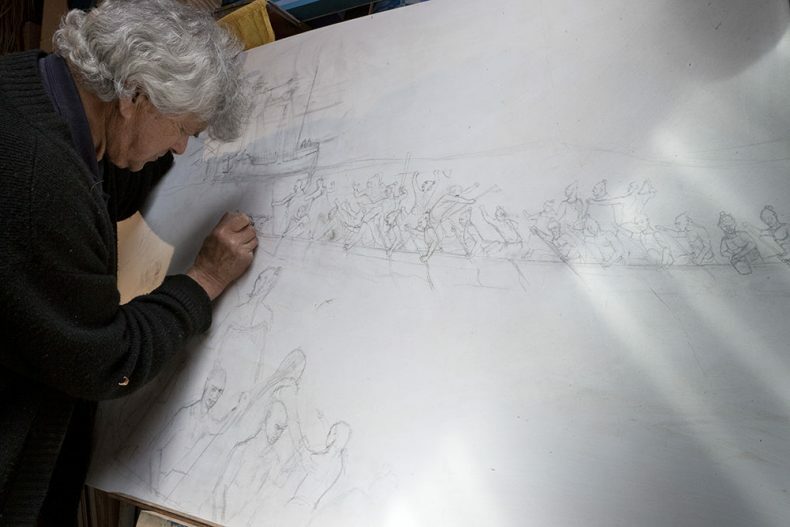 I was involved in the development of specific aspects of the Mana Whenua long-term Māori exhibition and building relationships with iwi and artist groups. Cliff assisted us to work with Haami Te Whaiti and Ngāti Hinewaka on the Makotukutuku wharenui, Te Tākinga Pātaka with Sam Jackson, Te Taru White (later to become the second Kaihautū) and Ngāti Pikiao, senior weavers around the country, and the Haumanu taonga puoro revivalist group led by HIrini Melbourne, Richard Nunns, and Brian Flintoff. We went on to establish long-term bonds with people as an outcome of the mahi. In many ways, it was the foundation of how we reclaimed an indigenous framework for museum practice, so that the objective was beyond just an exhibition, but rather the reconnection of people to taonga and mātauranga, and the potential for new opportunities to be generated. People came first. There were so many special times. Cliff with his trusty video camera recording our field trips, such as the raupō collecting and the located of totara logs in the Wairarapa ngāhere for the Makotukutuku wharepuni. The timber was then hewn using hafted stone tools, by members of Ngāti Hinewaka taught this ancient technology by Dante Bonica and Charles Koroneho. Our hui and wānanga with the Haumanu group were also amazing. Their vision to reinvigorate taonga puoro through the making and playing of puoro back to marae endures. At those early hui, it was a privilege to listen to Cliff, Hirini, and others speak of a day when taonga puoro would be a natural part of the music of Aotearoa New Zealand. I will always be grateful to Cliff for shaping and supporting my love of Māori art, taonga, and the work of museums with people. It was a privilege to have known him, his gentle, beloved wife Heather, son Dean, and their family. He will inspire forever. Moe mai rā e Pā. 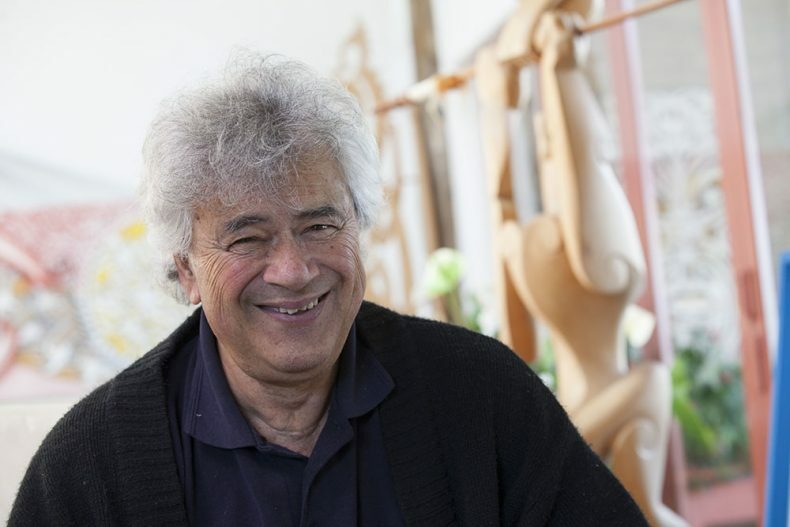 I first met Cliff Whiting in about 1990 when Cliff (and Heather) collaborated with tangata whenua in Otago to create a contemporary waharoa (gateway) for Otago Museum. At that time I was working for Ōtakou Rūnanga out on the peninsula and I thought it would be fun to dabble at doing some Māori art on the project during the weekend. Later I was part of a contingent from Ōtakou who worked on the contemporary Takahanga mārae project at Kaikōura. Cliff was leading that project too, enabling and empowering local communities to represent their own histories and culture. With few exceptions we were all amateurs with little to no artistic training. I remember wanting to draw a straight line and so I grabbed a ruler to do just that. That’s when Cliff intervened and said something like ‘What are you using a ruler for? Real artists don’t use rulers’. He then showed me how to draw a straight line by hand. He drew half the line and I had to finish it off. The Takahanga marae project was also a process of wānanga which Cliff would facilitate. A team of trained carvers came and installed their beautifully carved piece of work in the wharenui, which sat in contrast to our efforts. After they had left Cliff felt it was time for another talk. He said something like ‘Look at that piece of work. It’s perfect. That’s the problem, it’s too perfect. It’s like a facsimile replica of something carved in the 19th century. It’s like Māori art has stood still trapped in time. It doesn’t reflect what this project is all about. It’s probably not their fault though. That’s how they’ve been trained.’ We felt better after that. In 1994 I began working at the National Museum of New Zealand, as it was then known. Te Papa was in its formative stages and Cliff was Kaihautū at that critical time helping steer the museum into the bicultural institution it was to become. He always maintained an outward focus to engage with and empower Māori communities. And he always maintained a contemporary focus. 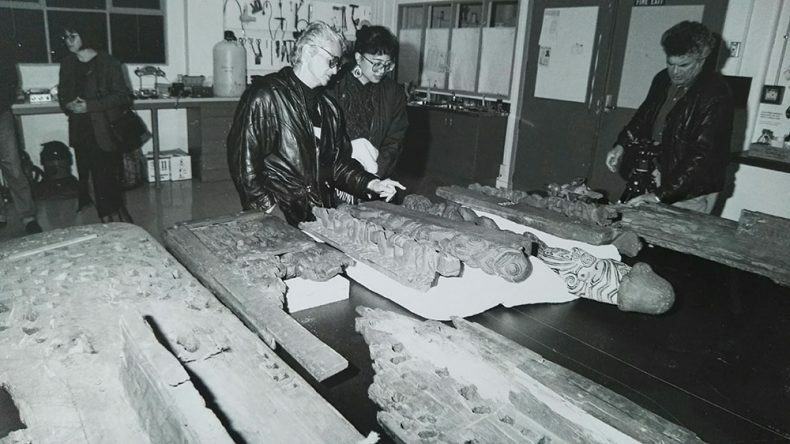 Cliff was quite confronting at times, questioning the role of taonga tūturu in museums in this day and age and questioning the role of our established museological practice in the care and use of those taonga. Lest we were to become the museum equivalent of classic Māori, lacking relevance in contemporary society. That challenge is something which continually helps focus the mind when curating taonga tūturu. It was somewhat confronting at the time but in hindsight it was a gift. No reira ka nui te mihi atu ki a koe e Cliff. Haere atu ra ki to okiokinga, ki Hawaikinui, Hawaikiroa, Hawaiki Pamamao. Maringi noa ngā roimata, hei whakatipu I te aroha mōu. Kua whakawhiti atu koe, ki te pō nui, te pō roa, te pō whakaū I te moe. Nō reira, haere atu rā e te Pāpā, haere ki ōu Tīpuna ki reira okioki ai. I was a host here at Te Papa when I first met Cliff. Back then the Museum was still under construction, and Cliff was not only Kaihautū, but also the Tohunga whakairo for Te Hono ki Hawaiki, the contemporary stylised wharenui/meeting house on level four. Cliff always had a smile, a ‘hardcase fullah’ at times. 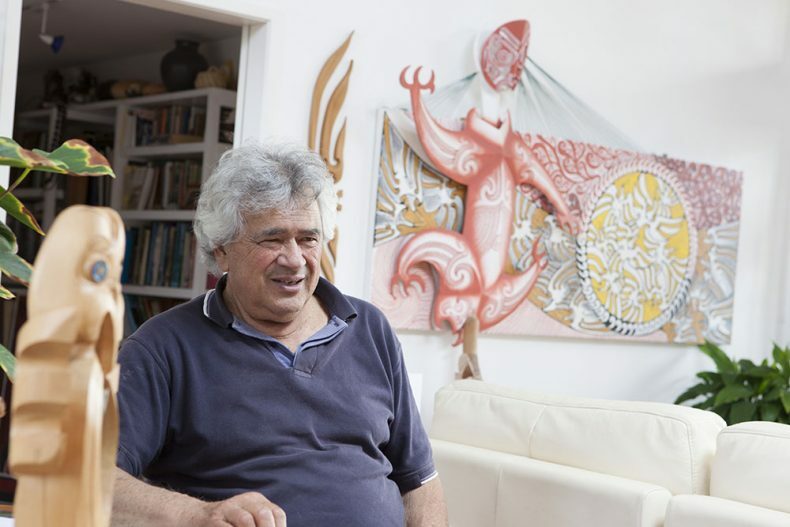 Quite often I would see him and my father, who was working on installing Te Hau ki Tuaranga, cracking jokes with each other – a great sight to see. He had a fantastic rapport with his tauira, his student carvers, that were learning this great, new innovative way in which to carve and construct this wharenui using contemporary materials. I remember sitting with him whilst he was weaving a kupenga – a fishing net – during one of his quiet times (which didn’t happen too often). That’s one of the cool things about sitting with kaumātua, the sharing of mātauranga, how he learnt, where he learnt, who taught him, ērā momo kōrero katoa. Although my time knowing him was only short, I will never forget the warmth of his smile, the kind man he was, and the sharing of matauranga with whomever he met… Tēnā rawa atu koe e te Pāpā. Nō reira, kia kaha koe Dean, koutou ko tō whānau whānui I tēnei wā taumaha, pōuri hoki. Kia kaha hoki koe ki te whai I ngā tapuwae o tō Pāpā, arā, ōu mahi nui whakaharahara huri noa I Marae o te motu. Ngā mihi maioha. Darian Zam – Check out pages 136-138 of ‘A Nest of Singing Birds:100 years of the New Zealand School Journal’, there’s korero in there about Cliff’s illustrations in the School Journal. A great Art lecturer/tutor at Palmerston North Teachers’ College in the 70’s. RIP. Interestingly no mention of his iconic school journal covers of the 1970s and 1980s.